“The focus of the new government will be expediting development and ensuring good governance.” says the Aruachal Dy Chief Minister Chowna Mein in a meeting with delegates of 34 Tuting-Yingkiong Intellectual Forum today. The delegates of 34 Tuting-Yingkiong Intellectual Forum paid a courtesy visit to Deputy Chief Minister to congratulate him at his office on Thursday morning. The delegates informed the Deputy Chief Minister of various problems being faced by the people of Tuting-Yingkiong, especially regarding poor performance of schools and dilapidated health sector. Mein was informed that many schools were running without teachers, and the lack of science teachers has drastically affected the performance of students in examinations. In a representation, the forum, led by Joint Commissioner (Tax & Excise) Tani Jongkeng informed that the topper from Upper Siang district stood at 177th position in the recently concluded Joint Entrance Examinations, which Jongkeng opined was because of the lack of a science teacher in the district. They also highlighted that hospitals and health centres are in dilapidated condition and are almost non-operational without sufficient doctors or health staff. He requested the Deputy Chief Minister to immediately make arrangements to post subject teachers and health staff in the district. After patient hearing, Mein assured the delegates that he would take up the matter and discuss the issues with the chief minister to readdress their grievances. 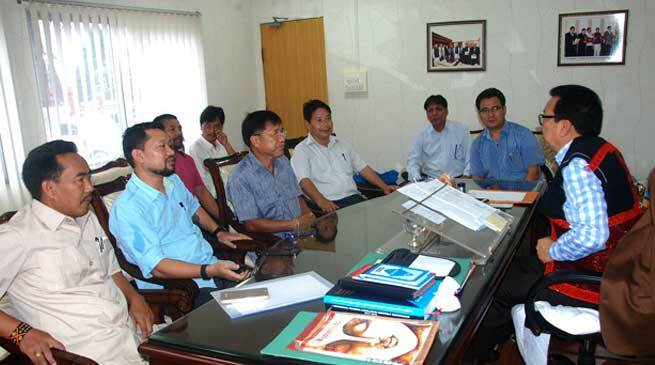 Deputy Chief Minister Mein said that the new government under able leadership of Chief Minister Pema Khandu will reach out to the people and focus on development and good governance and ensure better delivery of services. The six-member delegate of 34 Tuting-Yingkiong Intellectual Forum also included Tani Jongkeng, Joint CEO Genom Teksang, OSD Medical-Education Dr Raju Kamboh, DDST C R Khampa, DDHE Atik Jongkey and Superintendent PPCF Lelop Nobeng.